The Hume's hawk-owl (Ninox obscura) belongs to the family of owls and owlets, the Strigidae. 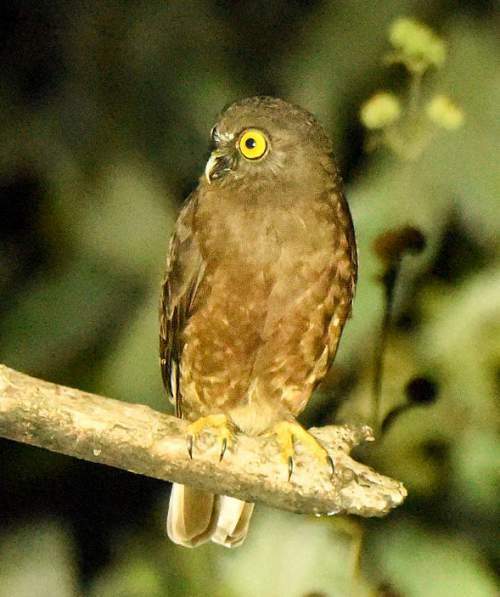 The Hume's hawk-owl species is endemic to the Andaman Islands in India. These hawk-owl species have dark chocolate-brown upperparts and underparts. These hawk-owls are monotypic species. The Hume's hawk-owl (Ninox obscura) is a medium-sized hawk-owl, measuring 25 to 30 cm in length. This species is highly nocturnal. 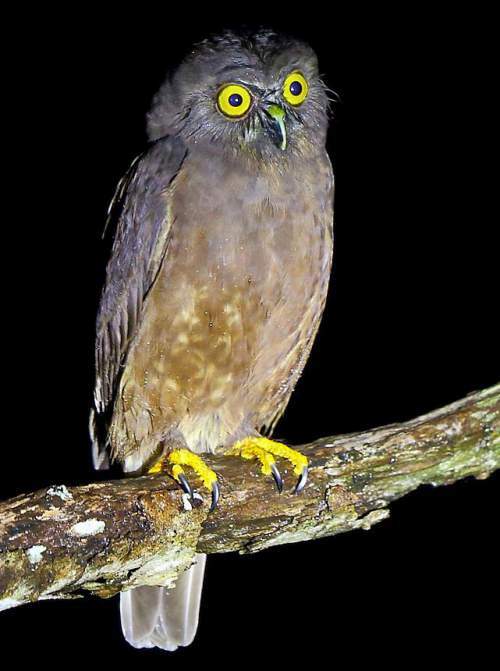 These hawk-owls have plain dark chocolate-brown plumage. The facial disc is not sharply defined. There is a small whitish spot on the forehead. The head is round. Lacking ear-tufts, this species appear hawk-like. There are dark rictal bristles. The underparts are slightly paler than the upperparts. The belly region has diffused, inconspicuous pale rufous patches. The tail is long. The undertail coverts have prominent whitish bands. The undertail feathers are partially whitish along the length. The bill is dark and curved. The irises are bright yellow. The legs and feet are covered with dark feathers. The bare toes are yellowish. The talons are sharp and steel gray. The call of these hawk-owl species is a repeated "woo-oop.. wooo-oop" or "oo-uk.. ooo-uk" sound. These hawk-owls are endemic to the Andaman Islands of India. The species Ninox obscura was described by Hume from a specimen obtained 'near Camorta', Central Nicobars (but the locality believed to be erroneous). Subsequently, specimens of these species could be collected only from the Andaman Islands. These Hume's hawk-owl species have moderate forest dependence. They normally occur in altitudes from 0 to 700 meters. The artificial ecosystems and habitats of these species include trees around agricultural fields, rural gardens, urban parks and borders of rubber plantations. The natural ecosystems and habitats of these Hume's hawk-owl species include tropical and subtropical moist lowland forests, tropical and subtropical dry shrublands, well-wooded country and edge of forests. The diet of this hawk-owl consists mainly of large insects. Invertebrates like large insects and also amphibians, lizards, small birds and small mammals are their primary food. This species are highly nocturnal. Not much is known on the breeding season and the breeding habits of these hawk-owls. The breeding season is likely to be in March and April as one month old juvenile was captured in Late May. Like other hawk-owls they are likely to be monogamous and lay three to five white eggs in tree holes. Both the parents incubate the eggs and take care of the young. These Hume's hawk-owl species are non-migratory resident birds. They disperse locally after breeding. The global population size of the Hume's hawk-owl (Ninox obscura) has not been quantified. The overall population trend of the species is considered to be stable. In most of its range, this species is reported to be locally common. The generation length is 4.1 years. Its distribution size is about 10,100 sq.km. Habitat alteration and destruction, deforestation, human intrusions and disturbance and trapping for pet-trade are the main threats that are endangering the survival of these hawk-owl species. The Hume's hawk-owl (Ninox obscura) does not approach the thresholds for being Vulnerable, either under the range size criterion, or under the population trend criterion or under the population size criterion. The CITES (Convention on International Trade in Endangered Species of Wild Fauna and Flora) status is ‘Not Evaluated’ for these hawk-owls (Ninox obscura). The Hume's hawk-owl (Ninox obscura) is closely related to brown hawk-owl (Ninox scutulata), northern boobook (Ninox japonica) and chocolate boobook (Ninox randi). Earlier, this hawk-owl was considered conspecific with brown hawk-owl. 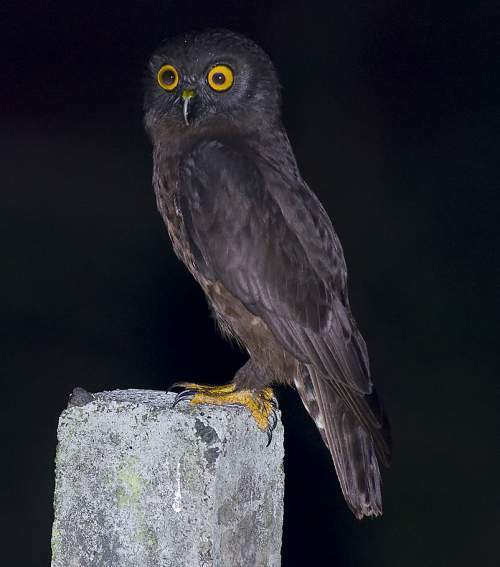 Current topic in Birds of India: Hume's hawk-owl - Ninox obscura.